These are the easy-to-wear essential plus size pants that you cannot live without. 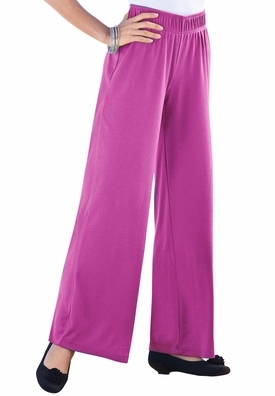 This beautiful pant has a flowing cut for ultimate style, ultimate flatter and ultimate comfort; the wide leg gives extra room to move elegantly with ease.Features a full elastic waistband, providing an effortless fit. The alluring pant sits at the natural waist, creating a modern and feminine look. The 2" waist band is stylish and comfortable.Cotton polyester blend Machine was for easy care. Imported. Please note this item pertains to the plus size standard chart, this is not a Sanctuarie Designs brand.